A couple weeks back, I was craving a vegan dessert that used coconut milk as its base. Now, normally, I keep a can of coconut milk in my cupboard at all times. It’s easy enough to do–shelf-stable, and good for so many applications–both savoury and sweet. But for some reason that day, my cupboard was coconut-milk free! I had used up my last can and not replaced it. So I started thinking about substitutions. What could I substitute for that can of coconut milk? Make your own coconut milk. Click here to learn how. Use a powdered coconut milk. I bought mine at the Bulk Barn, but there are several large manufacturers who also sell it in grocery stores. I’ve seen Grace Brand, for example, in my local Loblaws. Basically, you use a couple tablespoons of the powder and stir it into water or another non-dairy milk. Pure Creamed Coconut. This little pouch contains the milk, solids and fat from the coconut, so it gives you a more balanced coconut milk. 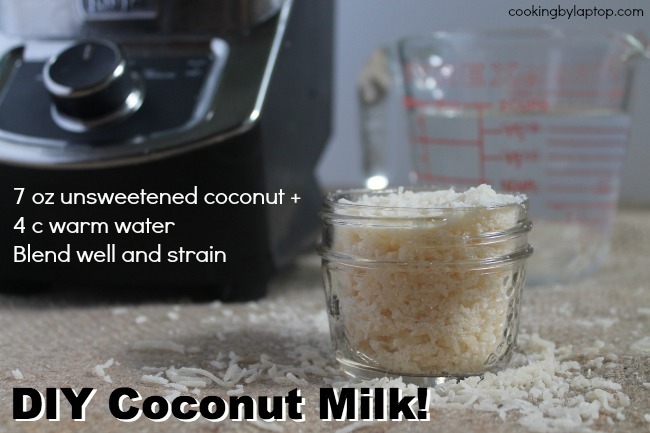 Again, you just add a few tablespoons to water to create your coconut milk. It’s available in grocery stores beside the canned coconut milk. I tried all 3 coconut milks, and examined them both for texture (thickness, creaminess, etc) and taste against canned coconut milk, and of the 3, the Pure Creamed Coconut was my favorite. While I like the idea of making my own coconut milk, it does leave behind a lot of solids, and unless you use those solids in some cookies or energy balls, that means waste. The coconut milk powder that I bought required me to mix it in with a non-dairy milk. I didn’t like this idea for two reasons: first off, you have to have non dairy milk on hand, and you may not. Secondly, the coconut milk just tasted like cashew milk (which was the base milk I mixed it into). What I have to experiment with is mixing the coconut milk powder into water and seeing how that turns out. The Pure Creamed Coconut was my fave and the most like canned coconut milk of the three. However, there were a few small solids in there, so just be aware that it may not be as smooth and creamy as your regular canned coconut milk. One last tip: if you are using pure creamed coconut, it helps to soak the unopened pouch in a bowl of hot water for 5 minutes or so before you use it to soften it up. Have you used coconut milk substitutes? What’s your favorite? Let me know in the comments below. A can of coconut milk is something my pantry is never without. I love that stuff. I use it a lot especially when I’m cooking vegan; it is an admirable substitute for whipping cream. I add it to pureed vegetable soups to give them that rich, creamy mouthfeel, I make ice cream, panna cotta and creme brûlée out of it. It’s also amazing in an Indian or a Thai curry. The problem with coconut milk is that the quality of the milk varies from can to can. I maybe just need to do more research, but I’ve not yet found a brand that I really have bonded with, so I usually just end up buying whatever’s on sale at the Asian Supermarket. Some are waterier, some are creamier… but it’s kind of a crapshoot. There is also some concern about BPA from tin cans. So, for just as cheap, or maybe even cheaper, you can make your own. It’s incredibly simple–you just need two ingredients, a blender, and some cheesecloth.